Atherton Collieries currently play in the North West Counties League Premier Division. Ahead of my visit for an FA Cup qualifying game with Bacup Borough, I got in touch with media officer Joseph Gibbons to get the lowdown on the side from Alder House. How did you get involved with Atherton Collieries? I had a Bolton Wanderers season ticket for many years and followed them home and away. My initial aim was to complete the 92 (which I am still doing) but I have been heavily sidetracked since I found non-league football. I started watching Colls during the 2011/12 season. One afternoon when I was off to The Reebok I got chatting to a bloke at the bus stop who had an Atherton Collieries hat on. Curious about a team who I had been doing a bit of research on, he informed me they were at home on Monday night and told me I should head down. It only took me five minutes to walk down to the ground and club secretary Emil let me in for free. Everybody was lovely and welcomed me despite the fact they didn’t know who I was. I was back again the following week and ever since then I have been hooked. Within a year I was helping out with the programme and was taking lots of photographs of the matches. My duties have been added to since then and I now help out with whatever needs doing alongside a large group of volunteers who all love helping out their football club. When I first started watching the club, the attendance was around 30 on a Monday night. There’s a real buzz about the place these days, and we managed to attract 609 when we launched Friday night football against Daisy Hill a couple of seasons ago. We’ve also played Bolton Wanderers the last two summers and have recorded crowds of around 1,800 on both occasions. Favourite memory as a Colls fan? I’m fortunate in the sense that during the five years I have been watching Colls, there has been a clear progression both on and off the field. The 2014/15 campaign went down as the best in the club’s history as we won the title, losing just one game in the process. We eventually clinched the title at our bitter rivals Atherton Laburnum Rovers and that afternoon will stay with me for the rest of my life. 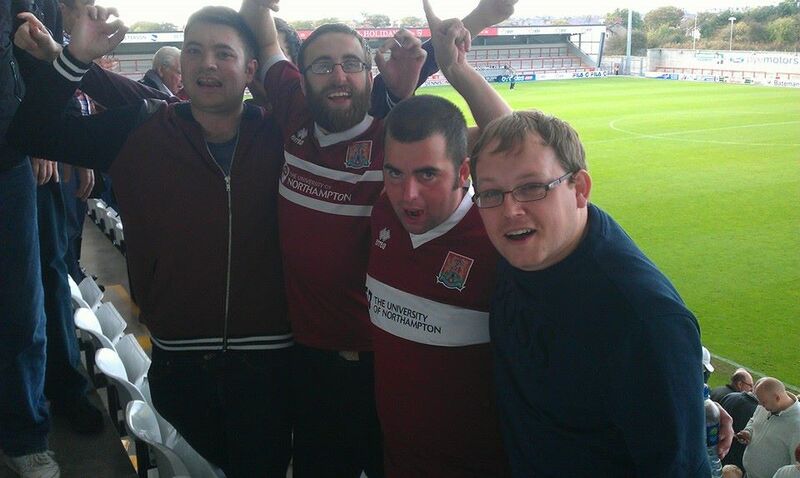 The memory that gets spoken about the most seems to be when we travelled to Brighouse Town in the FA Cup last season. They are the division above us and we went into the game as underdogs. All the players and fans piled on to the coach and we made our way up to Yorkshire, with the fans getting dropped off in the town centre to enjoy a few pre-match drinks. Spirits were high and we outnumbered our higher division hosts. We fell behind and had a goal disallowed, but Ben Hardcastle grabbed an equaliser during the second half and there was complete pandemonium with players and fans all hugging each other. The referee had to pick up a few cups off that pitch that had been full of beer prior to the goal. It wasn’t the most important goal in our history and it only led to a draw but the whole day is fondly remembered. That for me is what makes Atherton Collieries special. Yes, it’s great if you win, but if not we still make the most of the day regardless. Best game you’ve witnessed at Alder House? In terms of entertainment, I would say that whenever we play AFC Darwen the games are always entertaining. Whether this is home or away there’s always drama and talking points. The home match against them back in 2013 saw the two teams share seven goals. It was a Monday night under the lights and both teams were battling it out towards the top of the First Division. Colls were leading 3-2 with a few seconds of the game remaining when Darwen equalised. It was a cruel blow as we had been playing well all night and tensions were high on the pitch as a number of rash challenges flew in. Deep into stoppage time, our striker Paul Atherton stabbed the ball into the roof of the net from close range to give us all three points. Our attendances were lower back then, but I can guarantee if that occasion were to happen now there would be fans on the pitch and everything. Best players to play for Atherton Collieries? Probably the most famous player to pull on the black and white stripes is current Cardiff City striker Anthony Pilkington. He played for us in 2006 and made a name for himself scoring a hat-trick for us in a 3-0 victory against FC United. Stockport County signed him before he went on to play for Huddersfield Town and Norwich City. He also has nine caps for the Republic of Ireland to his name. We hope that members of our current team can go on to make a name for themselves in the Football League. Our players have all been young, local talents in the last couple of years and there is no reason why at least one of them can’t go a lot further if they are spotted by the right people. Best thing about Alder House? Alder House has vastly changed even since I started watching during the 2011/12 season. Historically, it was a ramshackle ground that many supporters in the league would have considered amongst the worst. Thanks to hard work from the committee and fans it is a very nice place to spend your Saturday afternoon and improvements continue every single month. For me, the clubhouse is now up there with the best in the league after a total refurbishment. A quirky feature of the ground is the retractable tunnel that was taken from Leigh RMI’s old ground, Hilton Park. The wheels might need pumping up on it but it’s still going strong and is one of it’s kind at this level. One thing I like about non-league football is that every ground has good and bad aspects. The imperfections that are on show are often the things that make a ground and give it some character. The less aesthetically pleasing a venue, the more I tend to like it. Yes, there are some grounds I have to go to when I’m watching Colls that I don’t particularly like… but I bet many people have moaned about having to visit us down the years! In short, there are no grounds I hate due to their appearance or facilities… there may be the odd one I hate as we always lose there or get a man sent off! We organise a jolly boys outing every summer, where we travel to a club who aren’t in our division and make a full day of it. The fans and players all pile on the same coach and set off early in the morning. A couple of weeks ago around 80 of us travelled to Carlisle City and spent the day drinking in the city centre before piling in taxis down to the ground. I think I eventually got in at about 04:00 in the morning after heading out drinking with a few of the players when we got back? There aren’t that many long journeys in our division this year, but I’ve travelled to Whitley Bay, Durham and Anglesey with Colls in the last couple of years and each day is always fantastic regardless of the result. Thoughts on ticket prices in general? I don’t even look at ticket prices of Football League clubs anymore. I know the vast majority will be far too expensive and most of the time aren’t worth it. By the time you’ve paid £30 to watch Bolton Wanderers at home in League One this season, you could have paid for your train fare, admission, programme, pie and five pints at a non-league match. It is far easier to make a full day of it at non-league level and you can do it on a budget. Of course, I like ticking off the 92, so I do sometimes pay £30 to watch a match but that’s now only a couple of times a season when I fancy spoiling myself. Atherton Collieries are well known in local football circles and we do have a few famous faces who come down to watch us occasionally. Kevin Davies has trained with us quite a lot since he retired a couple of years ago as has Nicky Hunt, who is from Atherton. Carlisle midfielder Luke Joyce regularly comes to matches when he isn’t playing, as again he is from Atherton and enjoys watching us play. Last season Manchester United defender Luke Shaw came down for a match because one of his mates was playing for us. We get quite a few local footballers down who have an interest in the club, but when they do come they get treated just like everybody else and I think they quite like that. I don’t know if it’s quirky, but the club is currently celebrating it’s 100th anniversary. We were formed by workers from the six mining pits in the town and were originally called Atherton Collieries Joint Association. Our current badge reflects this, as it displays the ACJA initials. The clubhouse is still on the same foundations that it was 100 years ago, and the players baths used to be downstairs in what is now the cellar. Last season was our highest league finish ever in our history after we came third in the NWCFL Premier Division. During a match in 2014 we had three sets of brothers on the pitch, including twins Paul and Karl Atherton which caught the attention of the BBC Non-League Show. Which club serves the best pies? People all have different views on this contentious issue, but I have been to Clitheroe on two occasions and both times I have had what I consider to be the best pie, peas and gravy I’ve had at a match. It’s very good value for money and you can even get a large cup of tea with it. The tea hut at Shawebridge is run like a military operation and is busy throughout the match.